1. When picking fabrics/colors for a project do you rely on the shop's employees or bring a friend along to help in decision making? Neither, really. Well, my mom used to put her two cents in, god knows, and sometimes I even listened to her! - but mostly I pick what *I* want and don't let anybody influence me too much. 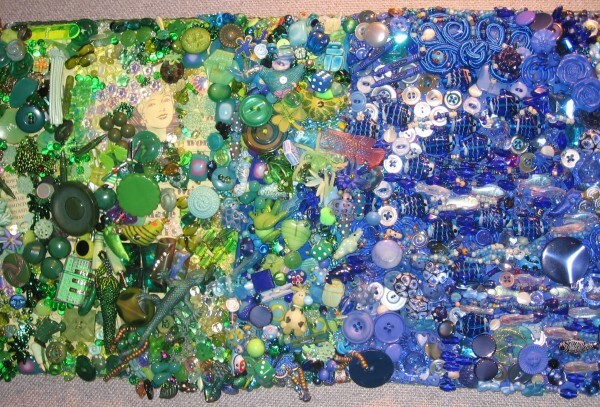 I have very definite opinions about color. 3. 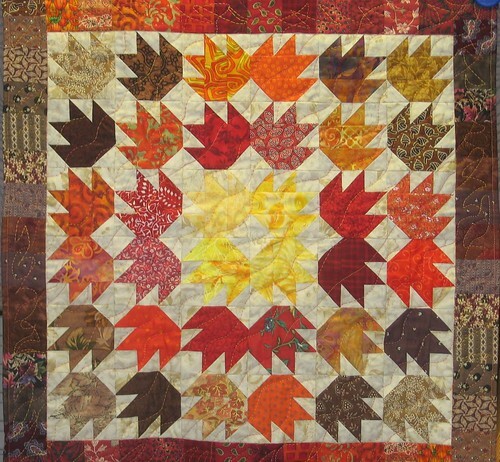 Do you make seasonal quilts? Yup. I'll put a picture of the last one I did below. I have also made Christmas ones once or twice. 4. How many projects do you have going on right now? 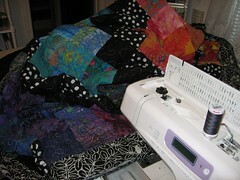 I'm in the middle of packing up to move, so real quilting projects are on the back burner til that's done. 5. What is this weekend's project? Packing, mostly. I might sort out fabric, some. Also I have an awful lot of fabric that needs to be washed, I could start on that! 9. The fabled pink quilt, which is only a pile of fabric right now - enough fabric for several quilts, actually. I think I may start out with triangles again on this one, and go from there. This pile of fabric probably has some Quilt Pink blocks in its future, too, although that's not what started it! 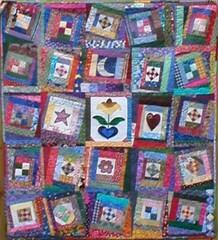 - crazy quilt blocks - I have 3, maybe make a 4th and then finish? 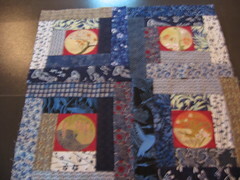 or make a table runner with the 3? 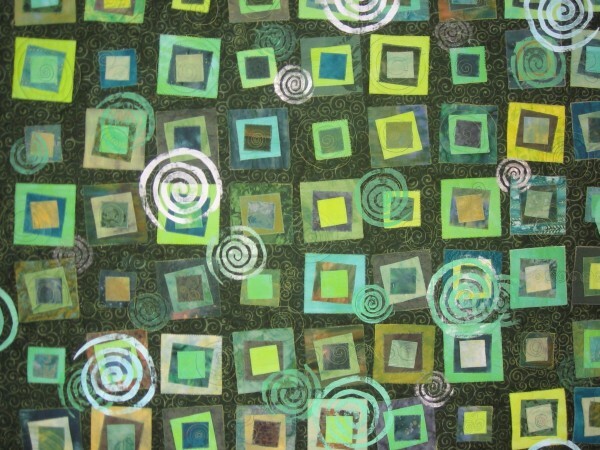 - leftover green squares from triangle quilt - I have lots of these! And also some HSTs. Note that this is not intended in any way to be an October to-do list! 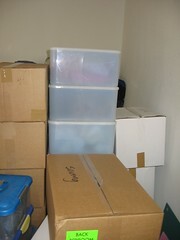 It'll be a miracle if I even get the sewing room decently unpacked in October. Maybe in November I might possibly get a reasonable amount of quilting done! 1. Have you ever done any redwork (machine or by hand)? A little bit. I used to embroider a good bit, back in the day, though. 2. Do you measure your finished rows to be sure they are the proper length? Not usually. It depends on the project. Usually I make sure the blocks are the same size, and if they are I just assume that the rows are going to fit. 4. 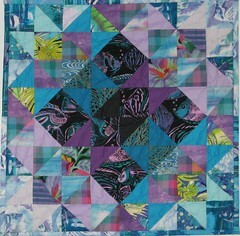 Share a random quilting picture. 5. Why did you share that random picture? 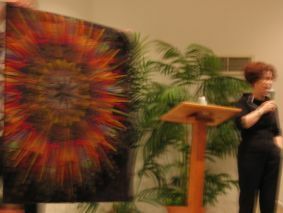 I was trying to really be random - I actually closed my eyes and pointed - but this is a quilt I like a lot, just the same. It was made by my friend karen_d, who also has a journal called Hat on Top. 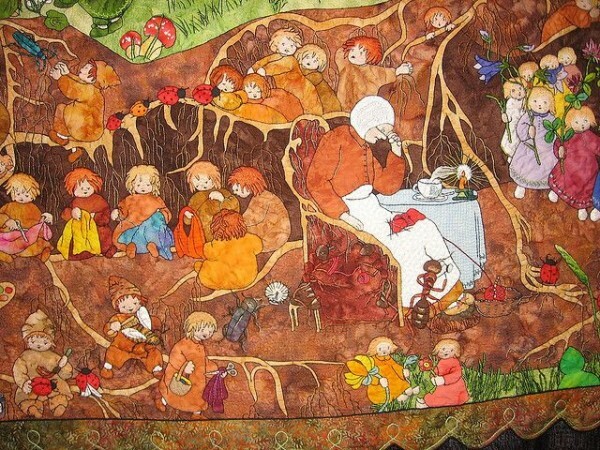 She makes some really great quilts. 1. Who's going to IQS? Me, me, me! 3. Have you been to IQS before? I am lucky, I live close by, so yes, many times. 4. What other shows have you been to this year? None, sadly. 5. Are you considering a future trip to IQS? I (almost) always do - what I am considering for next year is a trip somewhere else! 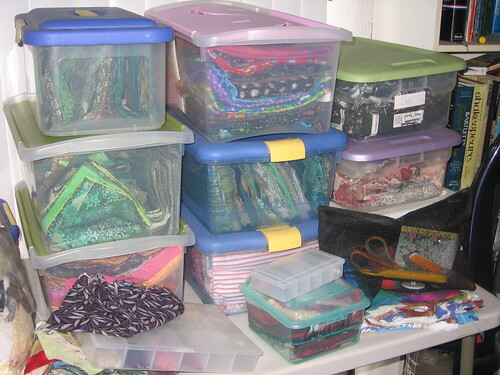 Background, for those of you who haven't heard about this ad nauseum already: we are about to move, and I will finally have a sewing room. The contents of my late mother's sewing room are mostly coming with me. 1. What do you use do your cutting on (do you have a table specifically for cutting)? I'm about to have one, but I'm not sure how much I will use it. My mother had one of those big waist-high folding tables, and I used to use it sometimes. Sometimes I think I would prefer to cut sitting down. This is one of those things I will have to see about as I go. 2. Does your sewing machine has its own table/cabinet? Yes, although at the moment it's sitting right beside me in a Tutto bag. 3. Do you use wall space for hanging things? Um, what kind of things are we talking about? I will probably do some sort of design wall - probably a flannel-backed tablecloth hung flannel-out, that's the simplest way I know of. After that, we'll see. 4. How do you come up with ideas for better use of your storage/space? I just go by what I see at other people's houses, mostly, and in pictures. Or what feels comfortable to me. All stacked up and ready to go (mostly)! The pile is now even higher than this, though.